The victim is the sister of Deirdre's boyfriend, Ben. The cause of death appears to be a plugged-in hair dryer that fell in the water. Ben, however, insists that a few volts couldn't have killed Ann. Like him, she's a descendent of the Cowichan tribe who, according to legend, has a way with lightning. One of the guests must have marked her for murder But when the suspects include a Russian pet psychic, a schizophrenic writer, and a random rock star, it's more than puzzling to Whiskey, Tango, and Foxtrot. It's electrifying...from author Dixie Lyle. 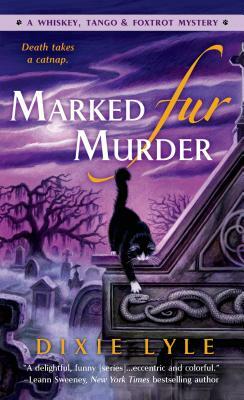 Dixie Lyle, author A Taste Fur Murder, To Die Fur, and Marked Fur Murder from the Whiskey, Tango and Foxtrot Mysteries from St. Martin's Books, loves animals, mysteries, books, reading, words, bad puns (are there any other kind?) and once had a torrid summer romance with an entire library. Did I mention the books? Oh, and definitely doesn't believe in the supernatural. Nope, not me. Hey, what was that sound? Where's that spooky green glow coming from? Oh, hello, didn't see you standing there in the corner, what with you being all see-through and everything. Want a cup of tea? Moan once for yes, twice for no. Allegations that Dixie Lyle has a goofy sense of humor are entirely unfounded, and should be forwarded to the unfounded and unlost department.